Increasing the proportion of disabled people in employment is a longstanding aim of public policy. Indeed, the aim of the UK government is to halve the disability employment gap by 2020. It is crucial to measure progress towards meeting this aim. However, this requires reliable methods to identify disability, differences in the employment rates of disabled and non-disabled people and to track these in a consistent manner over time. Unless reliable and consistent measures can be developed it will be impossible to measure progress towards the government target accurately. Our research shows that the main measure of the disability employment gap used by Government is fragile. The narrowing of the disability employment gap over the 2000s seen in the Labour Force Survey (LFS) is not evident when using other major government surveys. 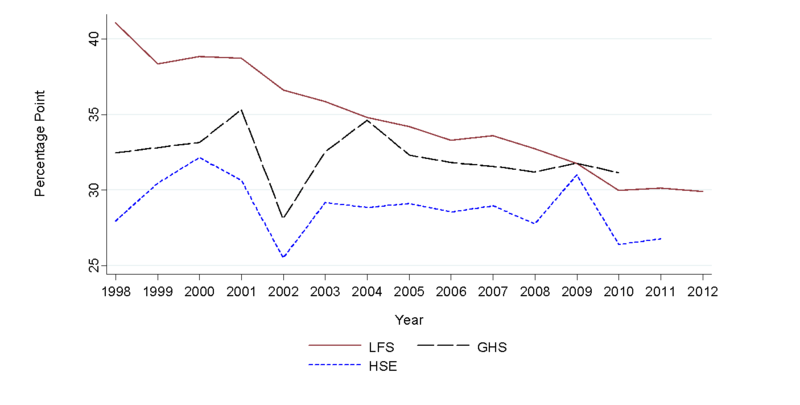 The LFS trend (in red) is downwards, while the General Household Survey (GHS) and Health Survey England (HSE) show no trend. The Disability Employment Gap (1998-2012) by Survey. The government’s main measure of the disability employment gap is taken from the LFS but regular changes to the questions which identify whether an individual is disabled have made it difficult to track trends in the disability employment rate over time. Further planned changes for 2019 would make tracking the Government’s aspiration of increasing the proportion of disabled people in employment almost impossible. It is essential therefore that further discontinuities in these data are avoided or are carefully managed using dual definitions in change over years. A ‘basket’ of indicators (which uses evidence from a range of surveys and across different measures of disability) would provide a more comprehensive and reliable picture of disability and employment in the UK. Jones, M. (2006) Is there employment discrimination against the disabled?, Economics Letters, 92, p32-37.